A lot of classic craft bars don't have a high power blender (or sometimes, they don't have any blender). And it makes perfectly sense. An electrical blender takes a lot of bar real estate (if it is "silenced" even more). It costs a lot. And if you have got one, people are insisting into frozen drinks all the time. And it is really noisy! But they are also useful. Fresh (but pressed before the shift) juices can be "whipped up" and guests appreciating the "freshness" (small trick out of my toolbox). Or you have got some foams, purees and so on to do - which need to be thoroughly blended. 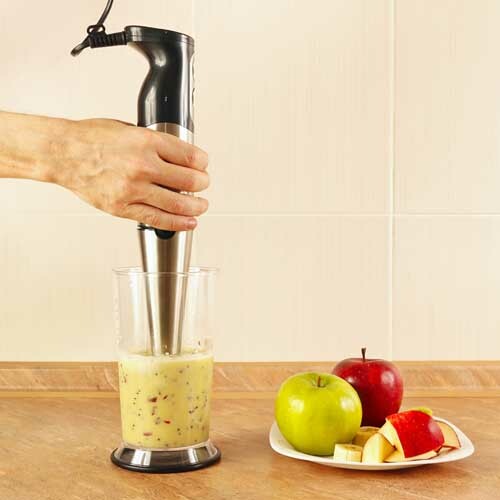 So for years I have been consistently struggling between the justifications for and against a blender - until a friend whined for a Piña Colada at home and I agreed one and used my inversion blender in my kitchen. This has been a Eureka moment - because it has been working really good. Not even longer than a week after, I have been buying an inversion blender for my bar (admittedly cheaper than my Bar Mix, which I had at home). Using the blender is so comfortable (it doesn't disturb guests much) - my guys even making cold processed rich syrup (and other syrups) with it. It is incredible that nobody in the bar seems to use it that much! On Amazon you can find inversion blenders from $20.00 - and even cheap blenders work well (I am still "in my first blender" which has been a "Black & Decker" and cost as much as $20.00). However when this first blender will say good-bye to the bar world, I might buy an inversion blender, which is better sealed (the ventilation holes are a bit unsettling, when consistently working close to a sink) - and maybe even a cordless blender - which would be even more comfortable. What you can do with an inversion blender? "Using it instead of reverse dry shaking" to foam up drinks. Aid infusions (e.g. herb infusions).